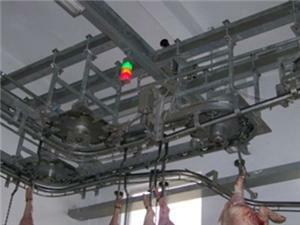 cattle slaughter machine,poultry slaughtering machine. Hoist to the bleeding line after stunning, included: hot galvanized secondary beams, rails, three set of slewing device, one set of hoist curved rail, one set of pig unloader curved rail, knock down chain and connection parts. Hanging space 1200mm.